Hitachi Rail Europe has signed a contract with Knorr-Bremse, which will see Knorr-Bremse supplying the braking system for the new Hitachi Class 800 series trains destined for UK operations. The signing took place at the Knorr-Bremse Rail Systems UK (KBRS) facility at Melksham in Wiltshire at a ceremony which was attended by senior representatives of Hitachi Rail Europe and the entire workforce of KBRS. 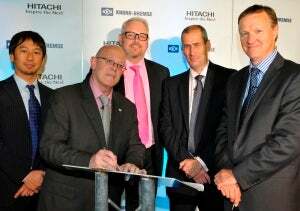 Keith Jordan, Managing Director, signed the contract on behalf of Hitachi Rail Europe and Paul Goodhand, Managing Director, signed the contract on behalf of Knorr-Bremse. Nearly nine hundred new train cars will be built at the brand new Hitachi Rail Europe facility under construction at Newton Aycliffe, in the UK. The Class 800 trains will come into service in 2017 as a result of the Intercity Express Programme initiative, initially replacing the existing Intercity 125 fleets on the Great Western Main Line. The new trains will also replace those currently operating on the long distance routes from London to destinations which include Aberdeen, Bristol, Cardiff and Edinburgh. Following their initial introduction new Hitachi Class 800/801 trains will also enter service on the East Coast Main Line during 2018. Knorr-Bremse will be supplying the entire braking system for the new trains including the brake control, bogie equipment and the air supply system. Brake control will be by Knorr-Bremse EP Compact, an electronic, advanced, but well proven system which offers precise control of the bogie equipment and includes Knorr-Bremse brake calipers and discs. The trains will also be equipped with the innovative Knorr-Bremse oil-free compressor which is much kinder to the environment than a conventional compressor. It uses no oil for lubrication, negating the need for the disposal of old oil, filters and condensate. The oil-free compressor is also remarkably quiet and vibration free, enhancing the high levels of passenger comfort which will be found on the impressive new train. Keith Jordan, Managing Director of Hitachi Rail Europe commenting at the signing ceremony said: "The Intercity Express Programme is a long-term project for us and we have demanding reliability targets. By partnering with Knorr-Bremse, we believe that we have found the right company to help us to achieve these goals. "Bringing the right level of reliability and technical compliance, coupled with UK experience and a low lifecycle cost, the Knorr-Bremse brake systems will contribute to the long-term success of the Hitachi Class 800 trains." Dr Dieter Wilhelm, Executive Board Member of the Knorr-Bremse Group commented: "We are proud that Knorr-Bremse has been chosen to play a key role in the creation of this exciting new Hitachi train. The co-ordinated effort and teamwork of Knorr-Bremse colleagues based in the UK, Germany and Japan has resulted in an outstanding braking systems solution for the Hitachi Class 800 trains. We now very much look forward to working with Hitachi Rail on this project and indeed to offering them further systems and services solutions for their other prestigious, global rail projects into the future." Paul Goodhand, Managing Director of Knorr-Bremse Rail Systems UK added: "We are all delighted here to become partners to Hitachi Rail Europe and have already formed a close working relationship with this dynamic company. "We are committed and indeed look forward, to supporting Hitachi Rail Europe in their UK manufacturing efforts, not only on the initial supply and commissioning of the brake system on this exciting new train, but also on providing support through its entire lifecycle, some twenty eight years into the future."